Two men are seen standing inside an elevator (lift) whose doors are half-closed. A third man is standing further back inside the elevator. The floor indicator above the elevator doors says “6” and an upward arrow is lit. Man 1: You know what I hate? Things we can't openly discuss. Man 2: Me too! Everybody knows but you can't say it! Tne next panel shows the elevator doors fully closed, and the floor indicator above the elevator doors now says “7”. The upward arrow is lit. The two men are now walking away from the elevator. Man 1: And we pretend it's not happening. Or if it is, it's others, not us. The men are now seen standing, still engaged in conversation. Man 1: We pretend that some groups do worse than others in IQ tests only because IQ tests are culturally biased. Man 1: So we use euphemisms. 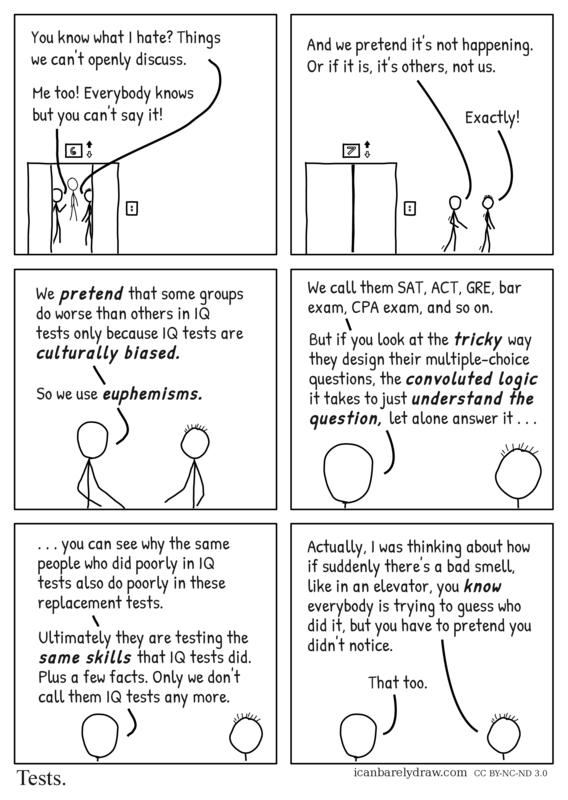 Man 1: We call them SAT, ACT, GRE, bar exam, CPA exam, and so on. Man 1: But if you look at the tricky way they design their multiple-choice questions, the convoluted logic it takes to just understand the question, let alone answer it . . .
Man 1: . . . you can see why the same people who did poorly in IQ tests also do poorly in these replacement tests. Man 1: Ultimately they are testing the same skills that IQ tests did. Plus a few facts. Only we don't call them IQ tests any more. Man 2: Actually, I was thinking about how if suddenly there's a bad smell, like in an elevator, you know everybody is trying to guess who did it, but you have to pretend you didn't notice.